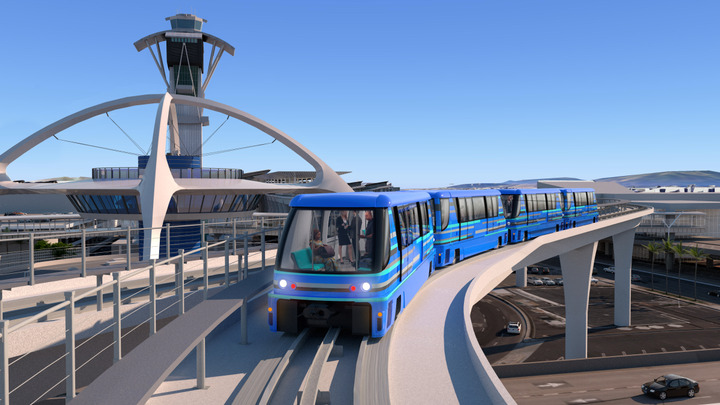 The automated people mover will run on a 2.25-mile elevated dual-lane guideway with six stations and create new connections between the airport, public and private transportation, and a new consolidated rental car facility. Rail technology developer Bombardier Transportation announced today that LAX Integrated Express Solutions (LINXS) has finalized a contract with Los Angeles World Airports to design, build, finance, operate, and maintain an automated people mover (APM) system at Los Angeles International Airport (LAX). The total contract is valued at approximately $4.9 billion. LAX is the fifth busiest airport in the world, and second busiest in the United States. The new APM system is one component of the airport’s Landside Access Modernization Program. The system will run on a 2.25-mile elevated dual-lane guideway with six stations and create new connections between the airport, public and private transportation, and a new consolidated rental car facility. The system will be built using a public-private partnership contracting model, the first automated people mover system to be procured this way in the United States. LINXS has attributed two contracts to joint ventures (JVs): one for the design-build portion and one for the operations and maintenance portion. The JV in charge of the design and build portion has awarded a contract to Bombardier valued at approximately $219 million. In addition, Bombardier has a 55% share in the operations and maintenance JV, which was awarded a contract valued at $576 million.